Hairstreaks are so called for the hair-like tails on the hind wings. They also have eyespots or markings on the hind wings. These two things combined can easily lead a predator to think that this part is the head and to take a bite off the wrong end, allowing the butterfly to escape, losing no more than a piece of wing. They are pretty little butterflies that can be seen flitting about over meadows, old fields, near forests most of the warm part of the year. There are many species, some are represented only in the east or only in the west of the United States. They are fairly small, gray, going from bluish to tan, with some colored pattern. 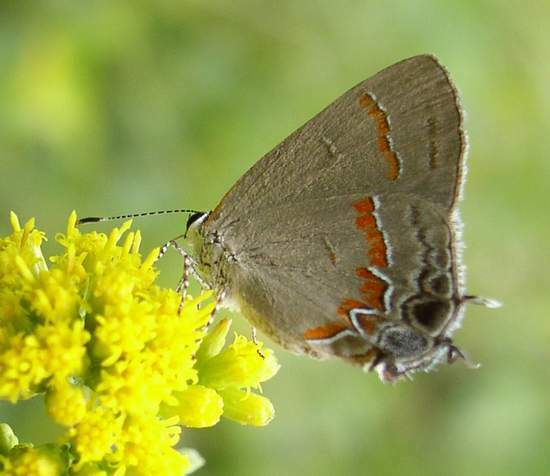 The red banded hairstreak, a common species in eastern United States, has a jagged red band with a border of a black and a white line on the underside of the wings. 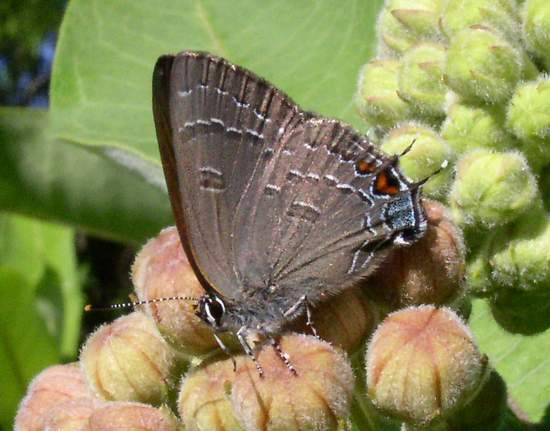 The banded hairstreak has variable dark and white markings on the underside of the wings; two orange spots on the hind wings and a metallic blue large spot. It is common in the east but it is also found in some western states. 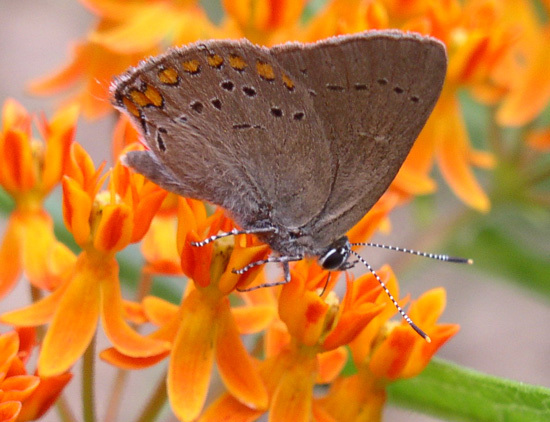 This and the coral hairstreak are often found on butterfly weed and other milkweed flowers, Asclepias. The coral hairstreak has a row of coral dots on the underside of the back wing and rows of smaller dark dots on front and back wings. It is unusual among hairstreaks in that it doesn’t have tails. Seen throughout the United States. Habitat. Edges of woodlands, sandy areas, old fields. Season. Early spring to fall. In southern states they can be seen throughout the year. Flowers. Many species of the aster family. Goldenrod is a favorite of some hairstreaks. Others are fond of milkweeds, butterfly weed.